In Sunday’s New York Times (print version), readers saw front-page pictures of two beautiful and tough, albeit very different Asian women. On the first page of the news section of yesterday’s Times was a picture of Daw Aung San Suu Kyi of Myanmar as she stood in Oslo on Saturday, finally free to accept her Nobel Peace Prize awarded in 1991. 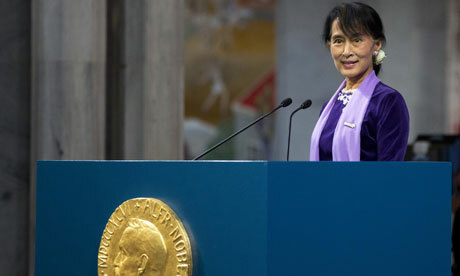 The photograph is by Daniel Sannum Lauten (Agence France Presse); his picture captures Aung San Suu Kyi looking out at her audience over the profile medallion bust of Alfred Nobel, her benefactor in the sense that his prize, in her words, “opened up a door in my heart.” We see a woman whose face projects a sense of welcoming, alertness, and curiosity; she appears completely open to her audience. On the first page of yesterday’s Sunday Styles section, readers confronted a large picture of Wendi Murdoch, who fixes the camera with a tough, challenging gaze. This photograph was taken in London in April by Facundo Arrizabalaga (European PressPhoto Agency) during News Corporation’s phone hacking scandal. 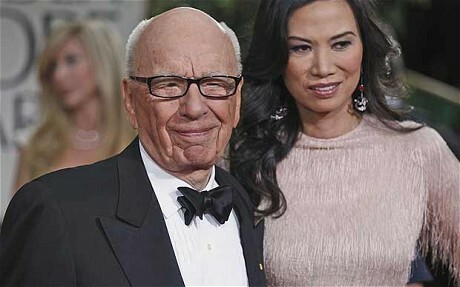 In a sense, Ms. Murdoch also stares out past her benefactor, her husband Rupert. Among one of the hundred richest people in the world, he has given her entree to the highest levels of international power and wealth. Here we see a woman whose face projects defiance, a withering look; she cautions the world beyond to keep its distance. Both photographs are equally compelling, even seductive. They make me want to know more about these two women: more than the fact that, last July, Wendi jumped to the defense of Rupert and slapped a pie-thrower during his Parliamentary hearings; and more than the fact that Aung San Suu Kyi had spent twenty-one years under house arrest in Burma, and only two months ago was elected to the lower house of the Burmese Parliament. Unfortunately, Wendi Murdoch declined to be interviewed for yesterday’s Times article by Amy Chozick, the title of which is “Declaration of Independence.” Thus, we have only second-hand information about her, most of which implies–with frustratingly few specifics–that she is molding a life independent of News Corporation, the hub of her husband’s world. We are fed little morsels, such as the fact that Wendi wanted to have her daughters meet those of Amy Chua, author of Battle Hymn of the Tiger Mother. After their first meeting, Chua remarked that Wendi “parents almost identically to the way that I do.” In other words, a form of demanding, tough love. Now, it may well be that Wendi Murdoch is not the sort of manipulative Dragon Lady that my selected sources imply. But with very little data and no primary source statements by her that might soften her image, Wendi as Dragon Lady has resonance. 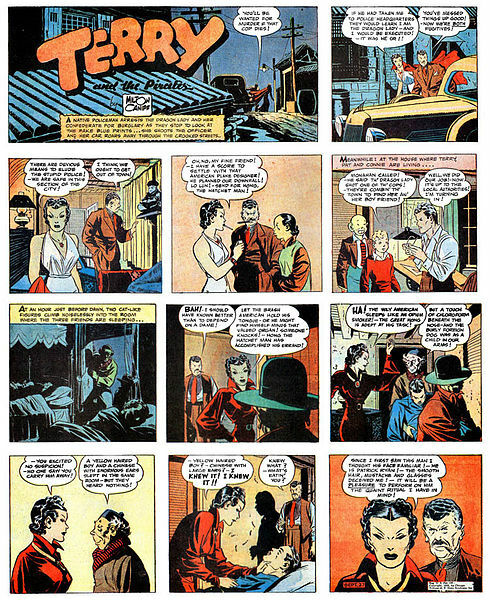 Understandably, the Dragon Lady is a Western stereotype, maybe best remembered from the mid-1930s-on comic strip, Terry and the Pirates. She is not an authentic part of Asian culture. Still, what we do know of Wendi does nothing to alter the possibility of her as a beautiful, tough, ruthless and seductive Dragon Lady. Robert Marquand, in an article in the Christian Science Monitor last week, observed that Aung San Suu Kyi “is in the tradition of Gandhi, Mandela, and Havel…. [and] there is something spiritual about her.” Indeed, there is something spiritual about her, and I am tempted to call her Guanyin. 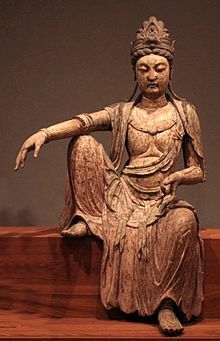 In Buddhist belief, Guanyin is the female bodhisattva associated with compassion, and her name means one who observes the cries of the world. The goal of a bodhisattva is to bring happiness to all sentient beings and relieve them from suffering. It is because these also are the goals and themes that Aung San Suu Kyi emphasized in her Nobel remarks in Oslo on Saturday that I associate her with Guanyin. And so, in a peculiar and roundabout way, this blog post, initially prompted simply by my visual attraction to newspaper photographs of two contemporary Asian women, manages to transform them into two radically divergent, iconic feminine types. Now, my wife, more Dragon Lady than Guanyin, says this is much too long for what it accomplishes, and she wouldn’t bother reading it. I expected as much, which is why I read it to her before publishing it. Like a good husband, I saved her from reading it tomorrow morning! This is a very interesting discussion, Tyko – thank you. 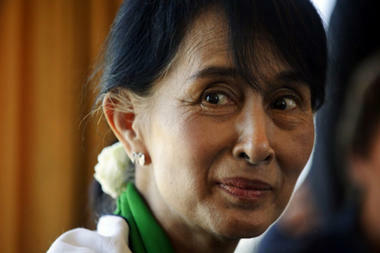 I, too, was struck by the Aung San Suu Kyi photo; the comparison of photos speaks volumes.